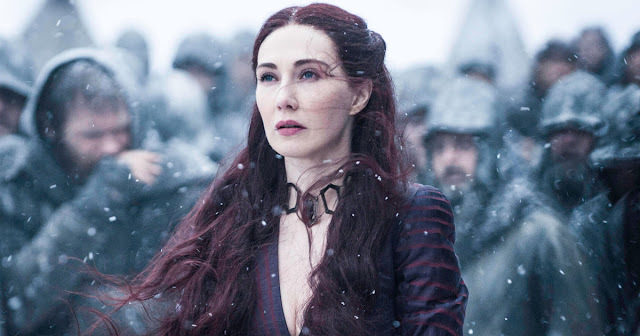 A few weeks back, I had a random co-worker tell me that I looked exactly like the witch Melisandre from Game of Thrones. She was like "Oh my gosh, you look so much like her!" Not being a Game of Thrones viewer myself I had to google her. It made me a really, really happy girl to hear that! I made a mental note to put a Game of Thrones disc on my Netflix queue and to maybe think about doing some Melisandra cosplay this Halloween. Well, during the last snowstorm, I had an unexpected snow day, so I thought it would be a fun time to play around with some dark, evil looking makeup. After a whole morning inside I started to get cabin fever and decided that I was going to go for a walk. Below freezing temperatures, 40mph winds, snow and ice be damned. This girl was bored! Honestly, I didn't even think Game of Thrones. I was going for a winter wonderland and instead snapped a shot of the evil Snow Queen bringing frozen fury to the land. Of course as soon as I put it up on Facebook all my friends started making Game of Thrones references. My pic got a lot of love. Heck, even my mom said she liked it. It's a great feeling ot know that my mom looks at my girl pictures and likes them now. That makes me pretty happy. Well, running off the evil winter queen thing, I decided to try a few more evil pictures with some various filters in Photoshop. You'll have to let me know which one is best. Looks like I am going to have to watch Game of Thrones and put together a Melisandra costume for Halloween. Pic 3 wins for face, that and the colors are right. Your eyes look fantastic. Pic 1 would of won, spiked fence*check,an ominous body of water*check,"castles" in the background*check...if you were wearing a wolf fur full length coat then it would've won. Your eyes in the last photo are amazing!